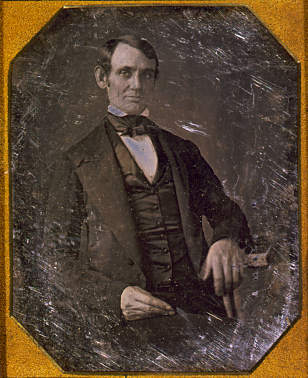 Abraham Lincoln, around the time he first met Joshua Reed Giddings in Washington. Daguerreotype from 1846 or 1847, attributed to Nicholas H. Shepherd. Library of Congress. As a congressman, Abraham Lincoln followed the debates over the Black Seminoles. Lincoln likely heard a great deal more about the maroons through his relationship to Giddings. The men became lifelong friends when the one-term Congressman and his wife boarded with Giddings at Mrs. Ann Sprigg’s house in Washington (1847-49). They would write frequently over the coming years, and in 1861, when “Father Giddings” had retired from Congress, Lincoln secured him an ambassadorship to Canada. In 1848, Lincoln voted against reparations for slaves lost during the Second Seminole War, affirming one of Giddings’ pet causes.